Inspired by traditional Balinese living, Villa Cemara comprises five alang-alang thatched pavilions, all carefully oriented for the stellar ocean views. A few steps beyond the traditional teakwood entrance doors is the open-sided living pavilion stretching along the beachfront and, across a koi pond to the rear, the villa kitchen. Next along the villa’s 60 metres of absolute beachfront is the 10-metre pool, then the master pavilion and raised corner balé. Looking over the length of the pool and out towards the sea are a pair of two-storey bedroom pavilions, each with two guest suites. 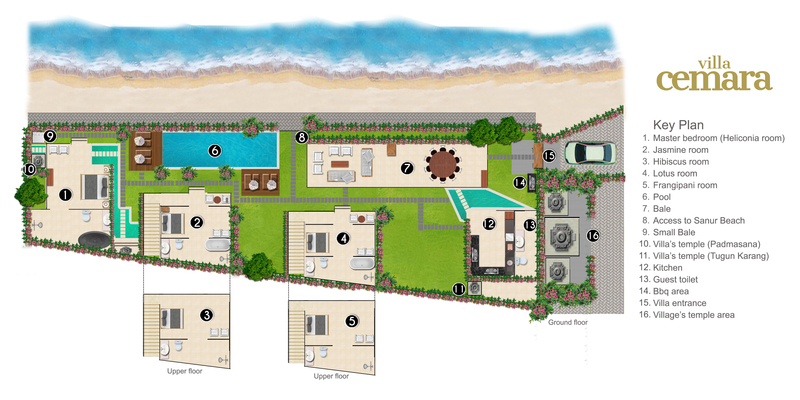 A gate between the living pavilion and pool gives direct access to the promenade and beach. All five bedroom suites are named after tropical flowers found in the villa gardens. Cooled by air-conditioning, ceiling fans or the sea breeze, they have quality beds dressed in crisp cotton linen, handsome teakwood furniture and intriguing lamps, blackout curtains and Bose speakers. Heliconia, the impressive master suite, occupies a stand-alone alang-alang thatched pavilion adjacent to the beach and separated from the pool area by a water feature. Stepping stones lead to a shaded Palimanan stone terrace where traditional Balinese doors open onto an elaborately carved feature wall running the full length of the suite. A handsome collection of antique furniture and Indonesian art decorate this air-conditioned and fan-cooled space, which is divided into a sleeping section furnished with a king-size bed, and a living area with cane armchairs and a large daybed facing a 42-inch TV. Beyond a wall of glass is a magical rock-garden with pond and waterfall. Out of sight is a dressing room with copious shelving and hanging space. Equally impressive is the air-conditioned bathroom with terrazzo twin vanity and, beyond glass doors, a garden courtyard where a jacuzzi is framed by a river-stone wall carved with fish and dotted with birds nest ferns, and an alfresco shower shares space with a water-wall. Villa Cemara’s four guest bedroom suites are housed in a pair of two-storey alang-alang thatched pavilions facing the ocean across the pool. All feature king-size beds (two convertible to twins), fascinating colonial-style furniture and artefacts, walk-through wardrobes, air-conditioning and ceiling fans. There is a 42-inch TV and DVD player in the two downstairs rooms, from where traditional carved Balinese doors open onto garden terraces with marble bistro table and chairs. The two upper level suites feature vaulted ceilings and reward guests with sweeping sea views through two walls of glass. All four bathrooms in the guest suites have an air-conditioned section with twin vanity and alfresco courtyard shower. Bathrooms in the garden suites also feature terrazzo bathtubs. Strategically positioned by the pool to accord guests a spectacular ocean vista, the huge open-sided living pavilion is Villa Cemara’s social hub. Chic contemporary armchairs, an over-sized sofa and traditional Indonesian daybed rest on a Palimanan stone floor under the soaring alang-alang thatched roof, promising convivial space for relaxing round the antique carved panel coffee table. In the dining area, a stunning marble-topped antique dining table comfortably seating 10 is the perfect setting for candlelit dinners, cooled by ceiling fans and the sea breeze. From the living pavilion, steps across a koi pond lead to the villa’s kitchen, handsomely designed and equipped with everything from coffee maker to commercial stove, wok to walk-in fridge. Sun worshipers will enjoy lounging on the two pool-side decks after taking a refreshing dip in the Bali green-stone pool. Those seeking shade for a siesta will gravitate to the alang-alang thatched balé raised above a waterfall-filled rock pool overlooking the beach.